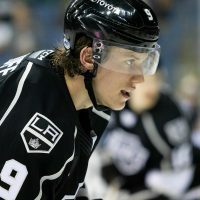 If you follow the Los Angeles Kings, you know the story all too well. Needing scoring help, the team makes a trade at the deadline to help give them some extra punch down the stretch. After much excitement from the fan base, the player doesn’t produce as expected. We’re not just talking about Dustin Penner. This could be the tale of any number of players the team has acquired over the last decade. Nearly every one of those players never returned after their brief 20-odd game run with the club. They’re just footnotes in team history. 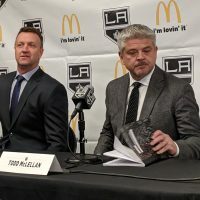 Yet,GM Dean Lombardibelieves the final chapter on Penner hasn’t been written yet. He’s expecting big things from the player he gave up multiple assets for, including this year’s number one draft pick. 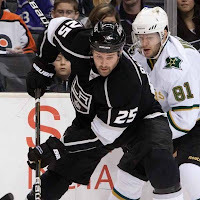 Along with the Kings recent addition of the Flyers Mike Richards, they’ve also picked up Colin Fraser in the deal that sent Ryan Smyth back to Edmonton. 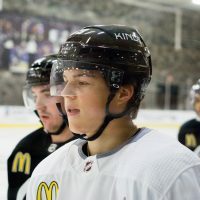 Fraser played 67 games with the Oilers during the 2010-11 campaign after coming over from the Chicago Blackhawks, where he played two full seasons. Given they were roommates in Edmonton, I caught up with Penner this week to get some comments on Fraser and it wasn’t long before we were also talking about his own numbers and what he’s focused on this summer. MM: What can you tell us about Fraser? DP: Well, obviously he has Stanley Cup experience. Being in a locker room full of guys who are all working towards a common goal of winning, it brings you a bit of knowledge on how to play this game at a high level. In the playoffs he probably didn’t get into as many games as other guys on that Stanley Cup team, but winning the Cup gives you a lot of confidence from just being part of that team. He competes in every area of the ice. He’s a third or fourth line center, who’s good on draws. He’ll do anything to help his team win. So, I think he’s a real character guy and he brings leadership in that aspect. He’s a good all around person too. So, hopefully he gets a chance and cracks the squad. MM: He was shown joking around a bit on the Oil Change documentary. Is he loose? Is he a funny guy? DP: Yeah. It was tough for him, coming over from Chicago. Like with me, it was tough coming over from the Ducks to the Oilers. The first year was an adjustment period. Now that he had that, he’s been traded again. So, I’m sure he’ll need a little bit of time to adjust here. But, it’s a great locker room here in LA. I don’t think he’ll have a problem here, especially considering we sat beside each other in Edmonton and we were roommates on the road. MM: Have you reached out to him at all and welcomed him to the team? DP: We just sent a few texts back and forth a little bit. I’m sure he’s busy. They just had a baby less than a year ago. So, they have a lot of stuff to figure out before the season starts, I’m sure. 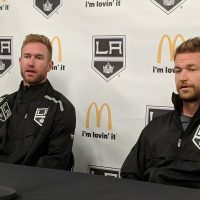 It’s always a stressful time for a family when you get traded, so it was just some quick banter back and forth welcoming him to the Kings. DP: I think I can speak for a few guys on the team. I think we’re all pretty excited, especially myself. 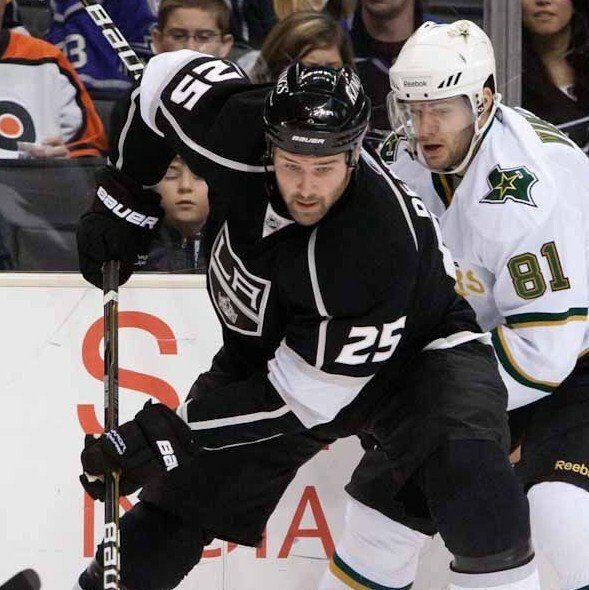 To get a guy like Mike Richards, who has won Olympic gold, has played on the international level and is obviously a proven leader and an ultra-competitor – just to see the way he plays, he’s always in your face, he’s flying all over the ice and making big hits, he’s fighting, he’s a great guy to have in the locker room. I know him a bit, just from playing together in the NHL and we have some mutual friends. So, I texted him as well when he was dealt here. He sounded pretty excited to come. I think the way the team is shaping up we’re looking to go deeper into the playoffs this year. MM: What about you then? So much has been written about your numbers not being up to par at the end of the season. Any thoughts on where things go from here and what you’re doing this summer to prepare for next year? DP: I’m looking to have personal bests this year in a lot of statistical categories. I think we have the team to do it. When a team does well so do the individuals. Obviously, it didn’t finish the way I wanted it to, personally and as a team. But, with the trainer I’m working with, Tim Adams, he’s getting me back into Bill Romanowski shape (former NFL player). He trained him back in the day. A lot of his workouts are something that I don’t think many guys have encountered before, in terms of the sheer volume of work we do. So, I’m excited to see the payoff for it. So are Lombardi, Coach Murray and many others.